Bamboo construction- the spice box is made from beautiful and sturdy bamboo, making it durable, and bacteria resistant. Bamboo also has a modern and stylish look that will complement any kitchen décor. 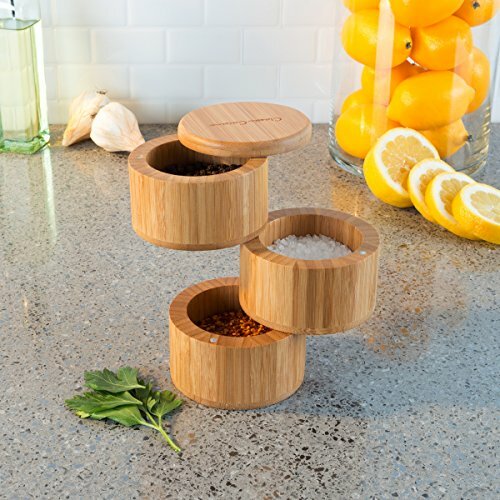 Triple tier- equipped with 3 compartments so you can store your most frequently used spices and herbs, this box is the perfect way to keep your salt, pepper and favorite seasoning blend within arm's reach on the countertop. Magnetic closures- each tier on this seasoning crock swings out to open and is equipped with internal magnets to hold each compartment in place when closed. Perfect gift- this high-quality spice box makes a great wedding, shower, birthday, housewarming or any occasion gift. Every home cook or foodie would love this well-crafted triple tiered spice crock! Product details-material: bamboo. Dimensions: (height)6", (diameter.5". wash before use. To clean, hand wash with damp cloth & towel Dry. Do not let item sit in water or remain wet for any length of time.